Bangko Sentral ng Pilipinas had created a commemorative coin to celebrate the visitation of Pope Francis in the country. While the used coins range up to 10 pesos, the papal coin has the denomination of 50 pesos and 500 pesos. Since the coins come in a special packaging and produced for the special occasion in the limited time offer, the 50 peso coin costs 100 pesos while the 500 peso coin costs 1000 pesos. The 50 peso coin had been produced with Nickel Brass while the 500 peso coin had been especially made from Nordic Gold. 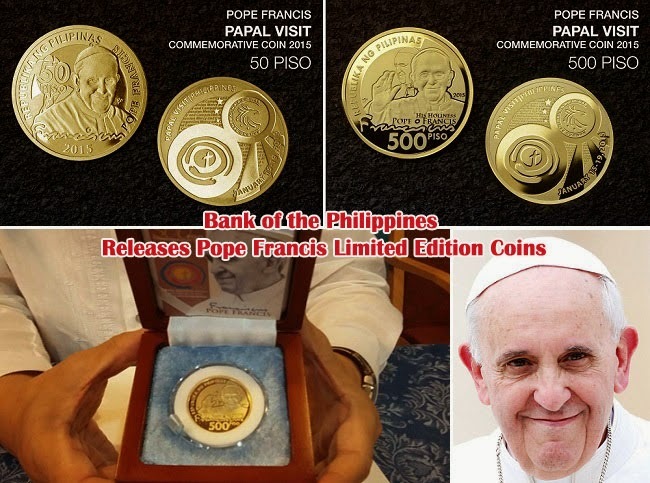 The limited coins bare the image of the Pope, his signature, ‘Republika ng Pilipinas’ markings together with ‘Pope Francis’, the denomination, ‘2015’ year mark and the bank’s Mint Mark. The tali side of the coin bares the words ‘Papal Visit’ or Philippines, logo of the Papal visit, the date and the theme of the visit ‘Mercy and Compassion’. Other coins made with silver of 1000 peso denomination and gold coin of 10,000 pesos will be available of May 2015. These coins will worth P3,500 and P25,000 respectively. These commemorative coins are not available over the counter and may be availed through the order forms provided by the bank. The forms must be submitted to papalcoins@bsp.gov.ph before the end of June 2015. After sending the order forms, an e-mail will be sent to confirm the order and give the date when the person can pay and pick up the special coin in BSP. The BSP had shared that the coins had been minted in coordination with the Vatican commemorative coins as such has been made for the special occasions or events in the history of the country. Pope Francis had visited Philippines from January15 to 19, 2015.